I know I’m not the only one who sometimes feels a little lost in life and wonders where to go from here. I’m sure you’ve felt that way too. Thought all was going well than bingo … decisions to make that can change your life. I don’t know about you but sometimes I know I need to change, however, am reluctant to change. Maybe it’s the uncertainty, maybe the fear or even just unsure if the decision I choose is the right one. Procrastination can stop you from making decisions. It sure stops me at times. Fortunately, it’s possible to stop feeling helpless when you learn how to feel the choice and take control of your decision making. Every day I work towards goals and invest time in personal development. Naturally, at times, it can be confusing knowing what to do. Yes, I may reverse engineer my goal and I know the basic steps to achieve the goal, yet I still think about it for a long time, before I proceed. Maybe there are times that you procrastinate way too long too. In general, you know what you want. In fact, you may even have written your life’s blueprint, yet the worry is still there. Decisions need to be made. As you and I both know the wrong decision can have a personal effect and maybe even a business effect. I guess the answer is to really understand what you want in life. However, finding your purpose and really understanding how you want to live your life takes time. It involves some working out and making some tough decisions. As a scout, I used to go on a penny hike where you flip a coin at every junction to decide which way to go. It was fun to do at the time, as you never knew where it would take you. The direction to go was chosen by a flip of the coin. At every junction, you flip a coin and if the coin landed heads up you go right and if the coin landed tails up you turned left. When you make decisions in life, big decisions like moving house, living in a different country or packing up and just travelling for a while, can’t really be decided by the toss of a coin. But, let’s say you have two events on at the same time that you want to attend. Naturally, you can’t be at both places at once. If you are finding it hard to chose which event to go to. Just flip a coin and go if the coin lands heads up. Secretly wishing for the coin to land on a particular side? If yes, why is that so, why do you want the coin on either heads or tails? Is fear your reason not to attend one of the events? If yes, is it the fear of stepping out of your comfort zone. Is it the fear you need to step through to overcome a limiting belief. Sometimes there are factors driving our decisions. These push and pull factors that are hard to navigate through. In these times it is good to ring a friend or mentor who knows you well and discuss your options, your preferences and your decisions. Naturally, if you would like to discuss an event you are unsure about attending than the person you are discussing with should not be someone going to one of the events. If you attend an event because of a person who is going that is a pull factor. Moving to live abroad is not an easy decision and push and pull factors will continue even when you live away. Deciding to stay or return will play heavily on your mind at times. This is what I found when my husband and I had children, when our parents were not well and when there are large family events. The push and pull factors saw us moving between three countries when the children were younger. Each time taking a simple list approach. The good or bad list is not Santas list but a list of reasons for and reasons against. The pro and cons list. In the list write up the advantages under the pros and disadvantages under the cons. Also at the bottom of the page fill out two what if’s. How would I feel if I make the right decision? What could I do to correct an incorrect decision? When you live abroad there are often outside influences that push or pull you between countries. At present, there are many expats in Spain concerned about Brexit who are struggling with decisions. This is an interesting read from the Devere Group. Devere Group is a company of which I have no affiliate with, however, I like their last comment about not letting an outside force influence your quality of life. Download the Pro and Cons printable – The Decision. 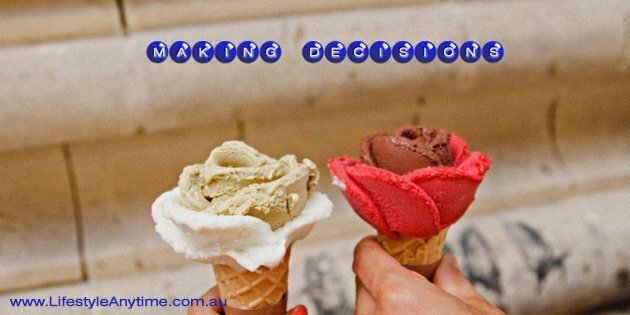 How do you make personal decisions in life? Every decision has a feeling, an emotion attached. So, no matter if you flip a coin, discuss it out or write a list you may find your feelings pulling you towards a certain decision. Ask yourself effective questions to discover if it is fear holding you back or ego driving you forward. Monitor your feelings and body reactions to certain words. Learn to feel the decision. Research but know you can learn as you go. Evaluate your decisions and don’t be afraid to activate the ‘what if’ plan if you need to. Making a choice on the important decisions in life. 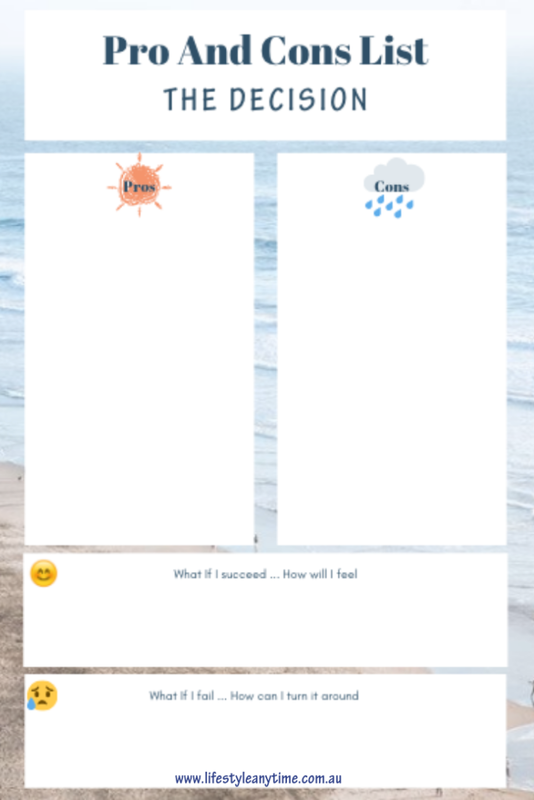 My hubby and I have activated our ‘what if’ plans on at least three occasions when it comes to international living. Our hearts were lying in Australia and our emotions with family in our birth countries. The push factors to stay were living close to family, friends, job security and location. Some of the pull factors were quality of life, work life balance, entrepreneurial opportunities and a warmer climate. Of course, important decisions should not be decided by the flip of a coin. However, decisions become easier when you slow down, ask yourself some questions, have a life vision and listen to your feelings. Needing more help on making decisions check out the below video from Marie Forleo with 4 simple test to help you make the right decision every time. Important decisions should not be decided by the flip of a coin. Important decisions should be informed decisions. 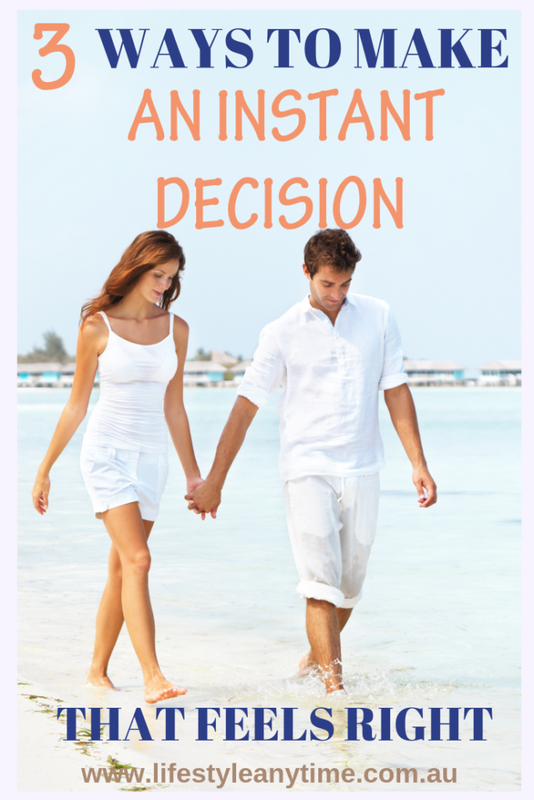 However, you can make instant decisions on small choices, as when no decision is made no action is taken. It is with action progress is made. Let’s work together and take some control of our lives. Stop procrastination, and stop leaving decisions to chance. Be the one who makes choice. Share how you make decisions in comments below. 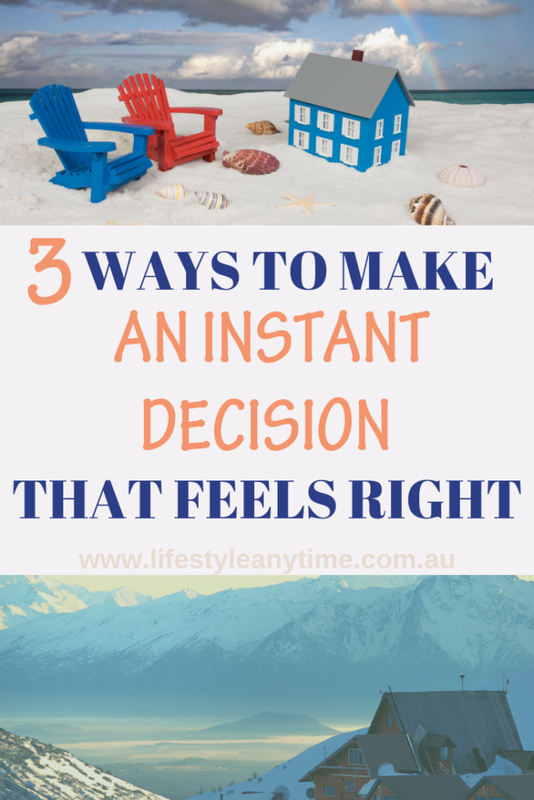 4 replies to "3 Ways To Make An Instant Decision That Feels Right"
Great post Angie. Making major life changing decisions can be hard. Once we made our decision to travel we set a date to leave home, otherwise we would have procrastinated and not left. Setting a date is definitely the best way to go. I know we too would not have lived overseas with the kids a few times if we hadn’t made the decision and set the date. I think, its time to set new dates here. I like this article. Yes, research is important when making an important decision. I also like to use someone as a sounding board before taking a leap. And when making decisions with my husband, we’ve made “Pros and Cons” lists too! Thank you Wendy, do you find that when speaking with someone, you reason with yourself why or why not to proceed with the important decision? I find I do.